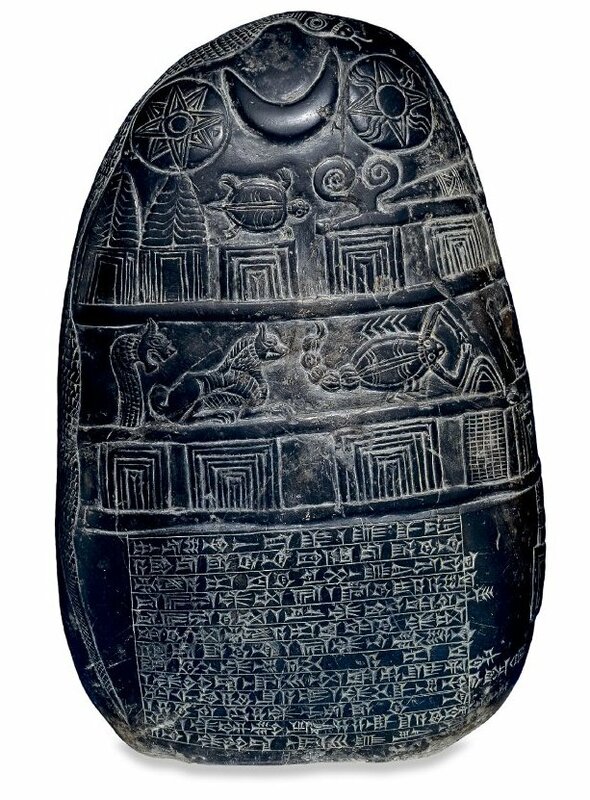 Although it’s a bit more complicated than will be generalized and simplified here, the common Anglophone word “star” and its story goes back to ancient Akkadian circa 2300-2000 BCE, a Semitic root language. This word drives at least in the Early to Middle Bronze Age when the ancient fertility goddess Ishtar (following her Sumerian antecedent as Inanna) was the Mesopotamian deity identified with the brightest object in the night sky after the moon: the planet Venus, which has a night sky brightness magnitude of between -4.6 and 3-.8. 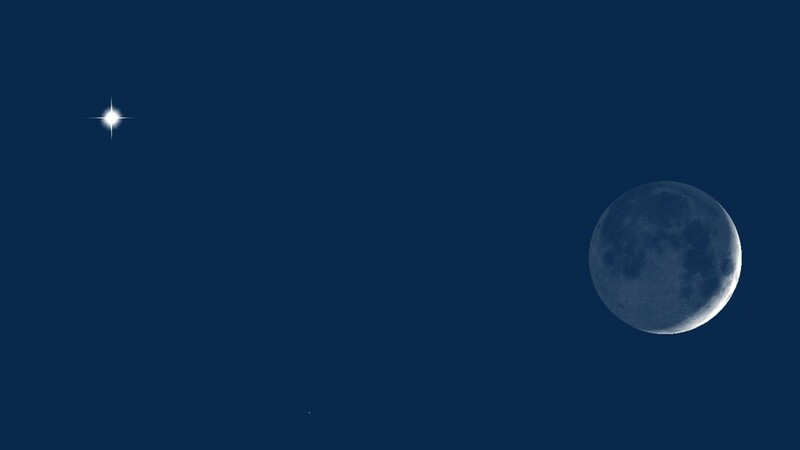 The above night photo has a similar Venus-Lunar position to the Babylonian kudurru below. 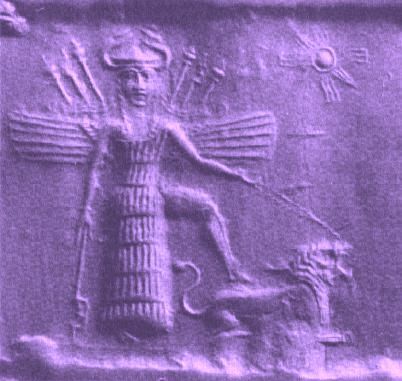 The lead image (artificially colored purple above) shows a Mesopotamian seal impression from the Bronze Age of winged Inanna-Ishtar standing on a feline with her horned head and bristling with scepters or weapons; next to her in the sky is her astronomical symbol with its extending rays, usually eight. The planetary deity Venus-Ishtar is also easily identified on Bronze Age Late Babylonian kudurru boundary stones for delineating fields that were annually flooded with new alluvium. For example, this dark limestone archaeological kudurru (ca. 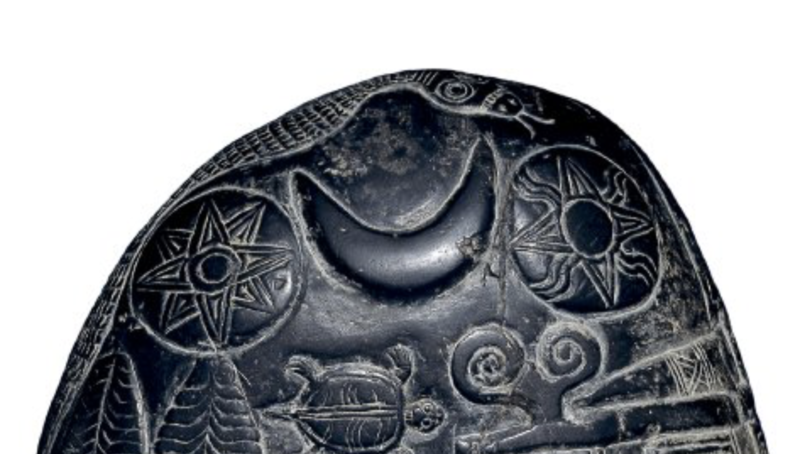 1125 BCE) of Gul-Eresh from the British Museum (see image above and below),  where Ishtar (Venus) is an eight-pointed star as part of a sky triad shown left to right along with Sin (the crescent moon here) and Shamash (the sun), the most important astronomical deities as brightest – therefore ruling – sky objects. The name ISHTAR (or Ištar) – goddess of love and war because spring heralds the fertility season as well as the time when armies can march and combat on drier ground – is linguistically sequenced in the IPA (International Phonetic Alphabet) as an initial vowel I followed by a frontal sibilant S (š)- voiceless post alveolar fricative – followed by a consonantal apico-alveolar or coronal alveolar stop T (tip of tongue touching back of upper teeth ridge) followed by medial vowel A and ending in a coronal retroflex or tap/flap R near the roof of the mouth. Related to Ishtar, other Ancient Near Eastern deities with cognate Semitic names include the Phoenician fertility goddess Astarte (AS-TAR-TE), also known in old Hebrew as Ashtoreth, retaining all of the similar phonemes ending with an added terminal syllable –TE, although Attar is another West Semitic name for the likely same goddess of Ugarit as Ishtar. When cultic worship for compounded Near Eastern love goddesses migrated west across to Cyprus, the new Greek language had Astarte or her near equivalent cross the Eastern Mediterranean strait as the “seafoam-born” Aphrodite, as Herodotus suggested. In Greek the word ASTER is the root for “star” as well, also compounding to ASTRONOMY. Similarly Roman religion also identified a love deity as the same astronomical goddess Venus. The Latin word STELLA (“star”) is almost the name: note the common L-R exchange – stella=star – since many languages confuse these two sounds issuing from a common place in the human voice box. In any case, the modern word STAR is the current final form for the Anglophone world, easily derived from its antecedent IšTAR after dropping the initial vowel over time. 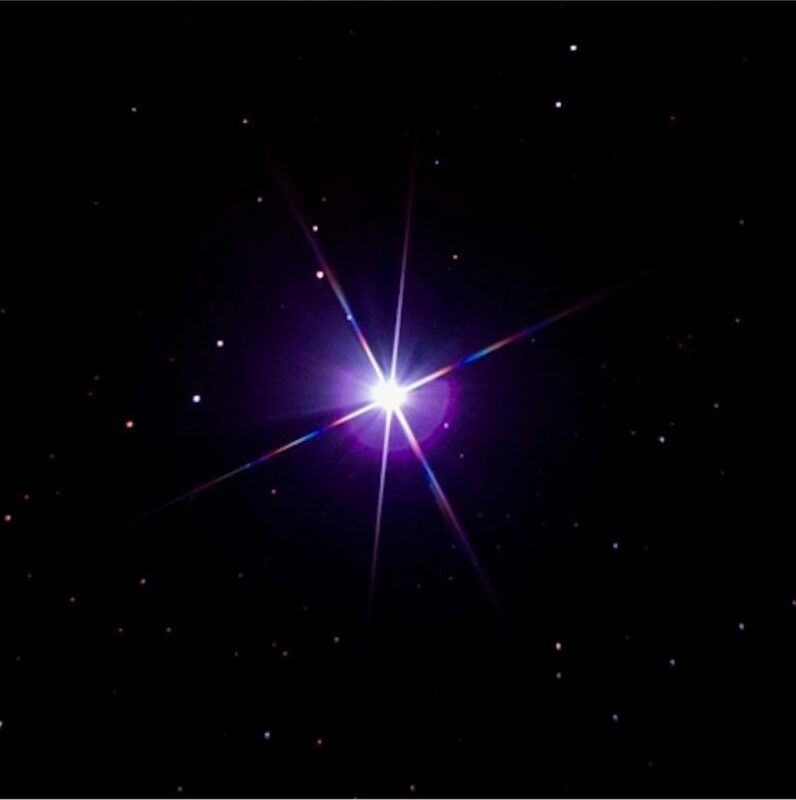 Therefore the word in English for “star” is definitely recognizable as an ancient one going back at least four millennia, so that when we utter the word “star we become shareholders of a very long language tradition. British Museum, London, Ancient Near Eastern Mesopotamia (Western Asia Dept. ), collection # 102485, height 14 inches. District of Edina, Babylon, ca. 1125-1100 BCE. D.T. Sugimoto, ed. Transformations of a Goddess: Ishtar – Astarte – Aphrodite. Fribourg & Goettingen: Academic Press / Vandenhoeck Ruprecht, 2014. Jean Bottéro. Religion in Ancient Mesopotamia. “Ishtar”. University of Chicago, 2004, 34 ff., 62-3. 102, 216, etc. Miroslav Marcovich. “From Ishtar to Aphrodite.” Journal of Aesthetic Education 30.2 (1996) 43-59; Stephanie Budin, “A Reconsideration of the Aphrodite-Ashtart Syncretism.” Numen 51.2 (2004) 95-145.